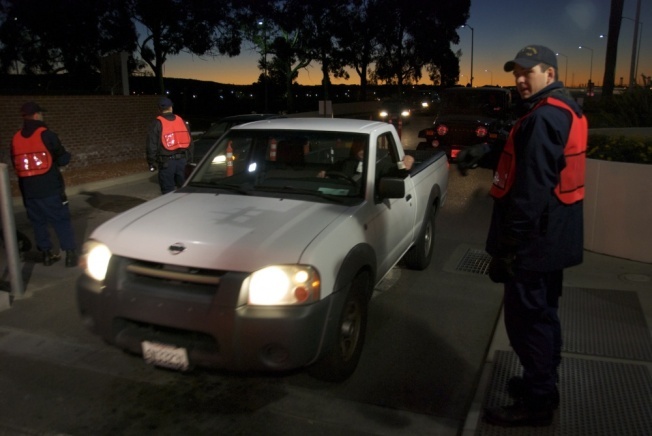 Jimmy Barlow works as a gate guard at Alameda’s Coast Guard Island in February 2011. The fourth day of the military court-martial of Coast Guard member Jimmy Barlow was primarily dedicated to a video recording of Barlow being interviewed by Alameda police detectives just hours after his daughter was rushed to the hospital in an unresponsive state. One of the police detectives in the video, Lt. Wayland Gee, a 27-year veteran of the Alameda Police Department, was also called as a witness by Coast Guard prosecutors. Barlow, 31, faces four counts of child endangerment and is accused of neglecting his three-year-old daughter Eden Lynch after she sustained injuries that ultimately led to her death in September 2011. The video recording played in court showed Barlow, subdued and sometimes crying, answering questions about his family’s home life and the days leading up to Eden’s hospitalization. Gee, who testified Thursday that the Alameda Police Department was contacted by medical professionals who were suspicious of the nature of Eden’s injuries, was one of two detectives depicted in the video questioning Barlow. In the video, Gee asks Barlow about the days leading up to Eden’s death. He also asked Barlow about his discipline practices, Eden’s medical history, and her recent behavior. Gee’s interview laid out a timeline of events going back to the previous week, when Jimmy and Holli Barlow claim Eden fell down a flight of concrete stairs outside the couple’s apartment. The video also revealed previously undisclosed information in the case, such as the fact that doctors found trauma on the inside of Eden’s throat. The timeline of events given by Barlow began the week prior to Eden’s hospitalization. In the video, Barlow told Gee about an argument with Holli. As a result of that argument, Barlow said Holli took her own daughter to Holli’s mother’s house in Vallejo on Thursday, Aug. 25. Jimmy says that’s the day Holli informed him that Eden had fallen down the concrete stairs at the apartment the day before, on Wednesday, Aug. 24. InvestigativeWhat Happened to Eden Lynch? “Not really, not at the time,” Barlow said. He told Gee that neither he nor Holli took Eden to the hospital after the fall because she seemed to be doing fine. Because Holli normally took care of Eden when Jimmy was at work, Jimmy had to take Eden to a Coast Guard day care center on Thursday, Aug. 25 and Friday, Aug. 26, when Holli was in Vallejo with her mom. Workers from the day care center testified Thursday that they did not see any bruises or signs of injury on Eden during the two days she attended. Otherwise, they would have reported it. During the interview, Barlow said he took Eden to Vallejo with him that Saturday in an effort to reconcile with Holli. According to Barlow, Eden stayed at Holli’s mom’s house while Jimmy and Holli stayed in a nearby hotel that night. The following day, Sunday, Aug. 28, Jimmy told Gee they took Eden to Discovery Kingdom in Vallejo. Barlow said she acted perfectly normal and happy over the course of that weekend. But on Monday, Aug. 29, Barlow told Gee that Eden’s behavior began to change. Barlow told Gee his daughter was scratching her face and trying to choke herself with a beaded necklace that belonged to her, although he later told Gee he did not witness this personally. Barlow said the following day, Tuesday Aug. 30, Eden’s unusual behavior continued. She urinated on herself four separate times, Barlow told Gee, and defecated on herself once. Barlow said Eden even tried to eat her own feces. When Gee asked if that was unusual for Eden, Barlow said that it was. Gee asked Barlow if he thought Eden had control of what she was doing. Barlow said he didn’t think so because she had been doing well with potty training recently. Despite Eden’s odd behavior over those two days, Barlow said he and Holli never took Eden to any medical professionals for an evaluation. On Wednesday, Aug. 31, the day Eden would be rushed to the hospital in a coma; Barlow received a call from Holli around lunchtime, telling him that Eden was acting strange, according to the police interview. According to Barlow, Holli said Eden was sitting in her room with a blank stare on her face, acting lifeless and emotionless. When Holli passed the phone to Eden, Barlow said Eden told him Holli was trying to make her play with Play-Doh. Soon after that conversation, according to the video, Barlow learned Eden had collapsed at home. Holli would later tell medical staff and police investigators that she heard a “thump” from the other room and found Eden convulsing and unconscious on the ground next to the table where she was playing with the Play-Doh. Towards the end of the interview, Gee told Barlow why he’s being interviewed by police: Because medical staff don’t believe the story that Holli and Jimmy recounted about Eden’s injuries. Barlow told Gee that Eden may have a genetic blood disorder that he believes runs in Eden’s family. Although he says she’s never been tested for it, Barlow said it may have contributed to her death. Barlow said he believed Eden’s death was the result of the fall down the stairs eight days prior. When confronted with the fact that doctors believed the blunt force trauma that led to Eden’s death could only have been two to three days old, Barlow told Gee he couldn’t recall any incident during that time period that could have contributed to his daughter’s death. But Gee also confronted Barlow about the fact that doctors told police Eden had trauma inside her throat, substantial enough that a 3-year-old could not have caused the damage. Barlow responds by saying he’s seen Eden grab her own throat before, and he thinks she’d be strong enough to bruise her own throat by pinching it. During Thursday’s testimony, Gee told the court he interviewed Holli Barlow the same night. However, because she is facing charges in a separate civilian court, the details of that interview were not disclosed. Following the video of Barlow’s interview with police, Coast Guard prosecutors played an audio recording of a “pretext” phone call that Erica Lynch, Eden’s mother, made to Barlow in October while police taped the conversation. Barlow gave a similar accounting of events to Lynch over the phone, and Gee confirmed to Barlow’s defense attorneys on cross examination that the call had little investigative value because Barlow never admitted any wrongdoing and his story was similar to the one he originally outlined for police. On cross examination, Barlow’s defense attorneys confirmed with Gee that both Holli and Jimmy willingly answered police questions and willingly turned over their electronic devices, including cell phones and computers. The prosecution plans to call more witnesses Friday, and possibly Saturday. Barlow’s defense team will likely begin calling witnesses early next week. Holli Barlow, currently facing a felony child abuse charge in Alameda County in connection with Eden’s death, observed the trial in the audience. She took the witness stand Wednesday and exercised her 5th Amendment rights protecting her from self-incrimination. NBC Bay Area will continue to bring updates as the trial progresses.